Bath snatched a late 20-27 Anglo Welsh LV Cup victory over Sale Sharks when Dave Attwood scored a dramatic last-minute try. The teams went into the break level at 10-10 with Michael Paterson touching down for Sale and Anthony Perenise responding for the visitors. 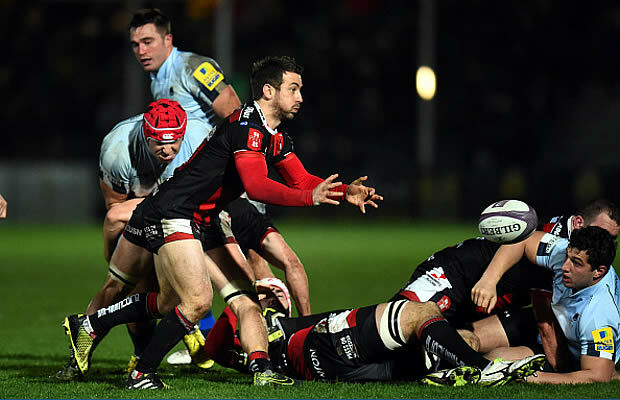 Tom Heathcote kciked his second penalty after the break before Matt Banahan scored for what looked be the game-winning try. But the hosts then hit back through Nick Macleod’s penalty and Mike Haley’s try before Attwood was the hero for Bath when he scampered clear. Sale: 15 Mike Haley, 14 Tom Arscott, 13 Andy Forsyth, 12 Mark Jennings, 11 Tom Brady, 10 Joe Ford, 9 Will Cliff, 8 Michael Paterson, 7 Dan Braid, 6 Jonathan Mills, 5 Tom Holmes, 4 Andrei Ostrikov, 3 Tony Buckley, 2 Marc Jones, 1 Ross Harrison. Bath: 15 Nick Abendanon (c), 14 Richard Lane, 13 Ollie Devoto, 12 Kyle Eastmond, 11 Tom Biggs, 10 Tom Heathcote, 9 Martin Roberts, 8 Leroy Houston. 7 Mat Gilbert, 6 Will Skuse, 5 Ryan Caldwell, 4 Dominic Day, 3 Anthony Perenise, 2 Ross Batty, 1 Nathan Catt. Replacements: 16 Tom Dunn, 17 Charlie Beech, 18 Kane Palma-Newport, 19 David Attwood, 20 Nick Koster, 21 Chris Cook, 22 Matt Banahan, 23 Anthony Watson.